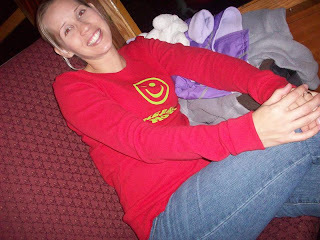 My name is Kelly and I am a mother of three kids, 2 girls and 1 boy. My New year's resolution is to get to the bottom of my never ending laundry pile. PLM- What a great photo. Shows exactly how we all feel!!!! My new years resolution for 2010 is to wake with a smile and be a happier person in the morning! I am so grateful for my husband and girls. This will help my family get off to a much better start each day! My 2010 New Years Resolution is to be more organized and "try" to be less stressed! PLM – It is stressful sometimes just trying to be less stressed! We are giving it our best too. 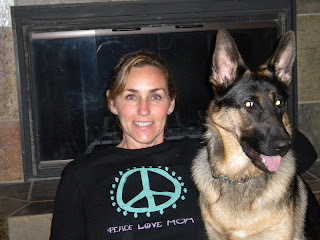 Attached please find my photo of me wearing my favorite PeaceLoveMom shirt. I wear it every week!! My resolution this year is to finally organize all of my closets! PLM – Great resolution. You have inspired us to start with our office. One desk at a time, one drawer a day! 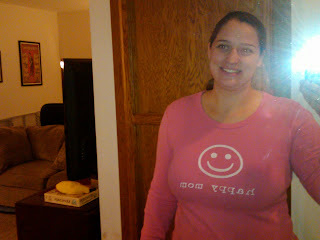 Attached is a picture of myself wearing one of your PeaceLoveMom Thermal. I absolutly love it! My New Year's resolution is to have more family time. Hello Peace Love Mom Company!! My New Year’s Resolution is to try and spend one-on-one time with each of my three children (ages, 5, 4 & 13mths)! PLM – Great Resolution. They will have their own special memories and so will you! What a great offer this is! My New Years Resolution this year is to learn to slow down a little and chill out! I am type A, always running a million miles an hour and have an inability to relax. Even when I am playing with the kids my mind is racing thinking of all the things I need to get done. I would like to learn to chill a little and be more in the moment when spending time with the kids to really really appreciate it. 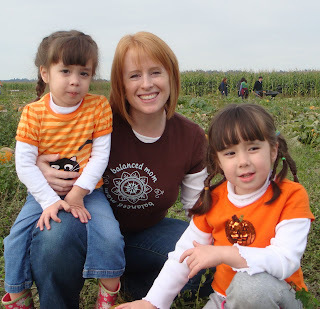 I am a stay at home mom and am lucky to have the time with them that I do. I appreciate that, but sometimes not as much as I think I should. PLM – Beautifully stated. We can certainly relate! This is a photo of me with one of my closest friends sporting our peace love mom shirts (I'm the brunette). My New Year's Resolution is to get in shape and be healthy again. I have started by eating more organic foods and walking four miles a week. I am a proud mother of two girls! PLM – This is the kind of photo we love…. Not one beautiful PeaceLoveMom, but two! You both look proud and healthy. 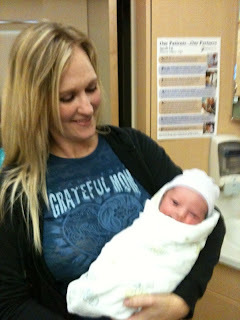 Thanks for celebrating Motherhood with PeaceLoveMom. My New Years Resolution is to do less housework and more playing!! One of my New Year’s Resolutions is to have my daughter potty trained soon as I have twins arriving in June 2010. I hope to buy a few Happy Baby onesies. Hopefully, they WILL be happy! PLM – They will be happy. Look how happy their big sister and mom already are!!! One of my new year's resolutions is to be less scatter-brained & see a task through from start to finish! I've set a bad example for my kids & need to improve!!! PLM – We agree. In fact, the idea of setting the example is what drives us. PLM – Please invite us over for those cooked meals. We are not even going to attempt that one! Thank you so much for running this promotion! My New Year's resolution for 2010 is to finish more of what I start. 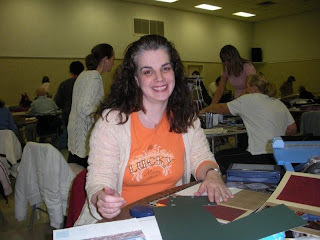 I am ambitious with the best of intentions, and so I enthusiastically start many things - from craft projects, to organization projects, graduate school...you name it and I am probably involved in it somehow! Being a mom of two beautiful healthy boys (4 months and 2 1/2 years) they are my priority and so other things tend to fall by the wayside leaving works-in-progress around my house. I love my family and my life right now, but I would like to finish their baby quilts while they are still small!! The photo was taken at a recent all day scrapbook event where I was trying to get caught up on my photo albums (don't let your babies grow up to be .jpegs!). One of my New Year's Resolutions is to worry less about getting things "crossed off my list" and just enjoy being with my kids more. 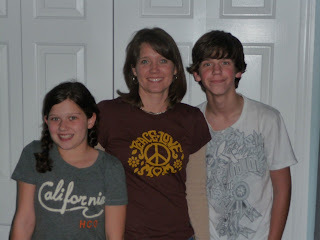 I've got my cute white Peace, Love, Mom tank on in this pic, son Ian is somewhat blocking it! New Years Resolution....Kiss my husband (of 13 years!) goodnight every night instead of just going to sleep! PLM – We hope you shared this resolution with him. Bet he loves it!! I am emailing you my new year's resolution for 2010 and a photo of myself and my daughter in Peace Love Mom. 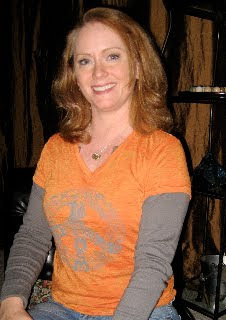 One of my resolutions for 2010 is to be healthy and energetic. I will stay healthy by excercising regularly (yoga, biking, stretching, hiking, dancing), eating healthy (being conscious of what I am eating), sleeping, and playing with my daughter (laughter). I love my life and want to feel my best everyday! PLM - Love your resolution. You are definitely living in the right city to help you do all of this! My New Years Resolution is to worry less about the mess in my house and spend that energy on my kids. Love your t-shirts. PLM- Love you in the long sleeve burn out. LOL about your mess. Ours is so bad we just pretend we don’t notice it! My resolution for the new year is to have more patience for life. I need to slow down and enjoy the moment! 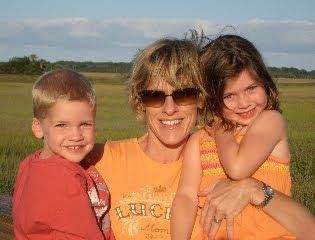 PLM - Hey all you PeaceLoveMom's out there... check this site out: www.pamperedchef.biz/micheleswindell What a great idea! Love your shirts so much! They totally ROCK! 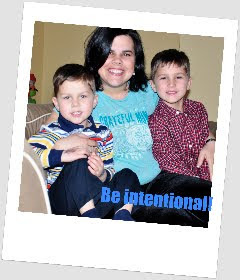 One of my new year's resolutions is to be intentional! Whether that is a MOM, WIFE, SISTER, FRIEND- make it all count! I'm so grateful to have been given the opportunity to be a Mommy to my two boys, and want them to know it in my words, my actions, and what all we do together. PLM - Love this one. Could be a new PLM message. Make it Count Mom! My New Year's Resolution is to lose my baby weight! PLM – We think you already did! My resolution: to eat more chocolate! Resolution: to eat more chocolate! 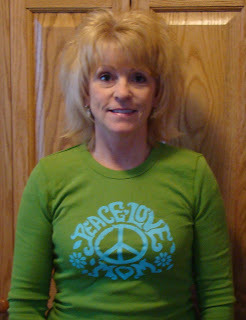 Hi my name is Linda, and I am a proud Peace Love Mom wearer! I have many of your items, as they are comfortable and very cool! I would say my New Year's resolution is to be better at everything I do...a better wife, mom, hairstylist, friend, daughter, sister, etc. I have so many wonderful people in my life, and I just want to be even better with all of them. Thank you for another amazing promotion...You rock! 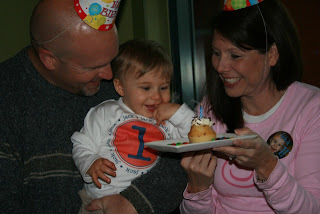 I'm afraid the shirt was a lie this day as my 2-year-old was being HORRIBLE! But in general I'm a Happy Mom. I made my New Year's Resolution late this year - on MLK Day. I am making his quote, "I have decided to stick with love. Hate is too great a burden to bear." my 2010 motto. I wouldn't call myself a "hater," but I do tend to be judgemental. This quote is a reminder to just love people. PLM – We would know our green color anywhere. One of our favorites. LOVE your resolution. Printing and putting up in the office for everyone to remember. Thanks! 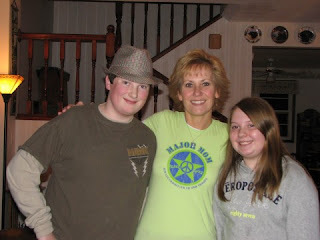 My News Years Resolution is to be the best Mom and Dad for my kids Ben & Sam. My husband Tim is on his way to Iraq and will be gone for a year. I am praying for more patience and to be there for them 110%! Thanks - love love love your clothes! PLM- Nancy we will keep your husband in our prayers. Special thanks to you and your family for making and keeping us safe. We are in your debt. My sister always tells her kids she is sending them to me for bootcamp. I hear it from our friends too! Our household has that fun reputation of being organized and scheduled like the military. With 5 kids it is a must!! BTW...Love the shirts I got!! I also got the Lucky Mom 24/7 and have gotten tons of compliments on it!! Thanks for fun and well-made products! 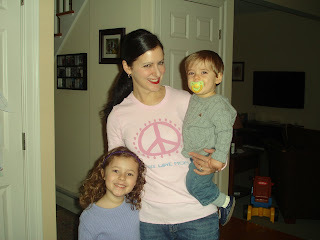 Lucky mom in her PeaceLoveMom tee! I've resolved to stress less and simply be with my kids! Your stuff is awesome and always reminds me how blessed I am. I love it. 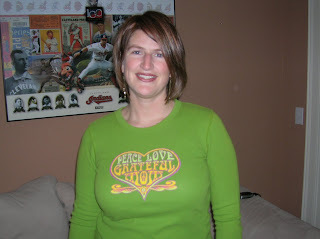 Photo of me in one of my MANY peace love mom shirts!!! My New Years Resolution is to learn to play the piano! One of my New Years resolutions is to read more with my children. Happy New Year to all! PLM – We are also going to try to more adult books too. My New Year's Resolution is to SLOW DOWN and not be in such a rush all the time. I want to enjoy all the little moments with my 3 girls. I've got one - BREATHE! My name is Cara and I have decided to give up on the normal New Year's Resolutions that we all hear (exercising, eating healthy, read x amount of books, etc) about each and every January. This year I have decided to be at PEACE with the way my life is; LOVE my family and friends daily; and be the best MOM that I can be to my children! These are my commitments for a HAPPY 2010! PLM - Well seeing how we are PeaceLoveMom, we certainly could not agree more with this! My New Years resolution for 2010 is to be a better wife to my husband. I feel like I am a great mom but could improve on the wife front. PLM – We agree. It is so hard to have the extra energy left at the end of the day. This is on our list too! 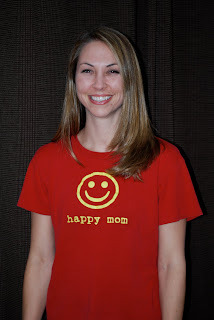 I've attached a photo of me in my short-sleeved Happy Mom tee, which is one of my favorite t-shirts. It is also my four-year-old son's favorite--he always tells me how much he likes it and given the choice he will always pick it out for me to wear. 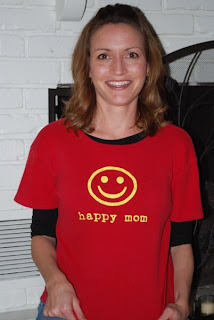 I really like your t-shirts and your company's ethos; it's wonderful to see motherhood celebrated! So here's one of my resolutions: to run a 42 minute or less 10K (my current PB is 43:13). To count my points everyday and lose the baby weight by June! 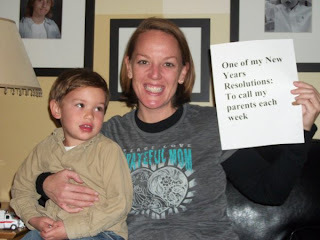 My name is Jennifer and my resolution is to not let my family or my children take the joy out of each day. So many times I let the "mood" of the day or things that people say affect my entire day, and I am resolving to not let that happen any more. PLM – I looks like you are doing just fine. What a great photo! Love and Logic… a great new tee shirt idea for us! 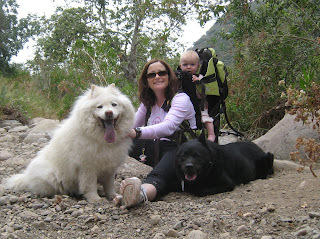 My New Year's Resolution: To take care of myself just as good as I do my children and husband! PLM – Love the picture. We are so thrilled to celebrate Motherhood with you. Thank you for participating. 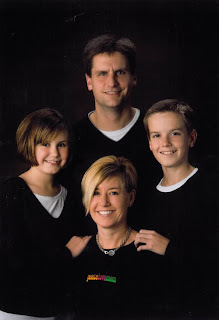 PLM – This is the most beautiful family photo we have ever seen! Thank you for sharing your resolution and this picture. We love it! PLM – We think you look just great! I pick a word for the year and this year it is BALANCE. 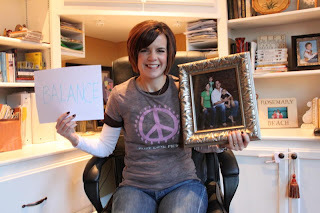 I am hoping to better balance being mom of 2 boys, wife, work-at-home employee, christian, and friend. Thankfully I have the whole year to work on it! 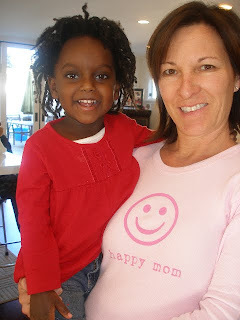 LOVE your tees and your message that mothering matters! 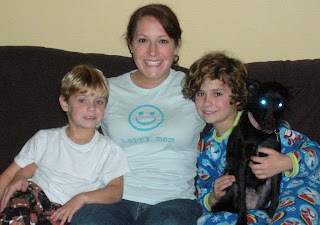 Here is a picture of me with my beloved "Major Mom" thermal, with my youngest of 3 boys. Luke is 2 years old. My New Year's Resolution is to spend more one-on-one time with each of my boys, doing an activity that they really enjoy (or just hanging out ;-). PLM – Thanks for the photo. What a great looking group! Can’t wait to hear about what your boys want to do. My resolution: to take care of myself as well as I take care of my children! 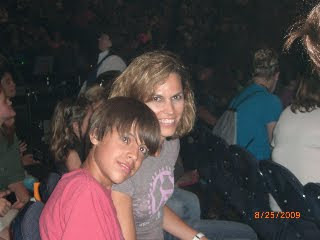 A resolution for 2010 is to set a great example for my son by creating a healthy and happy household for my family. I want to do more active things together and cook healthy meals at home. I also intend to compete in at least one triathlon alongside my husband this year! What an amazing offer, thanks so much! PLM- If you go back to Disney, check out their Marathon. Most fun race PLM has ever done. Good luck and keep us posted on your success. My New Year's Resolution is to be in God's Word daily, to not let my circumstances determine my joy, and to love my family well! PLM – Thanks for sharing. These are great. One resolution is to organize our closets. PLM – oh how we wish you would come do ours too! We are going to start with our desks and maybe, just maybe get to the closet by the end of the year. My New Years Resolution is to exercise more. Exercise more patience with my girls. Exercise by walking with my dog. Exercise the need to put myself first. And finally to exercise my facial muscles by finding the humor in everything. 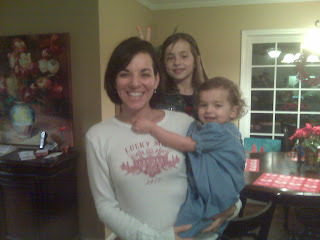 My resolution: to wear PLM shirts to remember what a lucky mom I am! To start each day with 30 minutes of quiet time for myself, meditation and prayer! No if's and's or but's... When I take care of my mental health, the whole family benefits! PLM- We love the fact that you live in a town called Whispering Pines. It fits in so perfectly with your resolution. One of my New Years Resolutions this year is to contact my parents on a weekly basis. They live 1000 miles away and are in my thoughts every day, but it is so easy to get caught up with what is going within your four walls and forget about making the effort to connect with family far away. PLM – Margaret – What a wonderful and thoughtful resolution. You are a PeaceLoveMom and a PeaceLoveKid all in one. Our parents did so much for us. It is important to always show them the love and respect they deserve. My resolution: to spend more time outside! My resolution: slow down and have more fun! 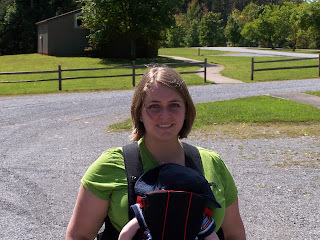 My resolution: to lose the baby weight! My resolution: to be calmer with my kiddos! My resolution: to add more adventure to my life!